These images caught my attention in the introduction of my Art History textbook. 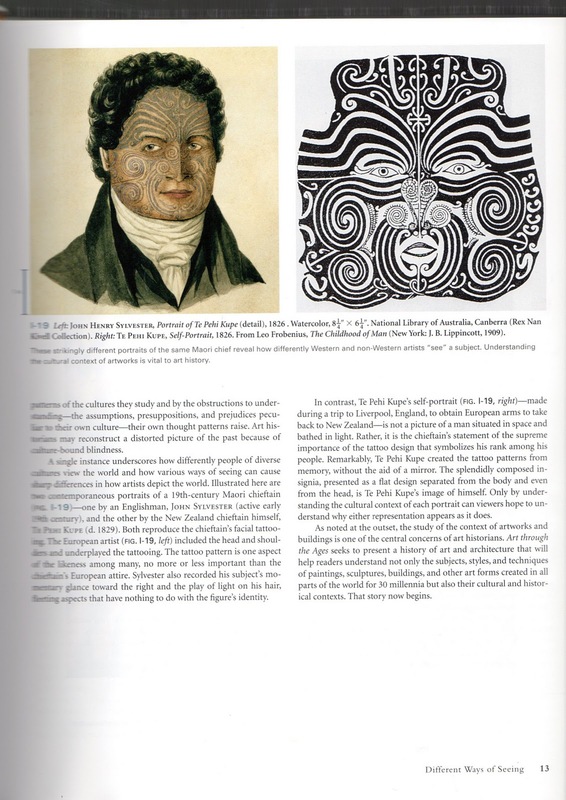 On the left is a painting called Portrait of Te Pehi Kupe (1826) by an Englishman named John Henry Sylvester. Te Pehi Kupe was a man from New Zealand who was visiting England to gather arms to take back home. On the right is a self- portrait created by Te Pehi Kupe. We see that in his self-portrait Te Pehi Kupe presents himself through a flat representation of his tattoos. Te Pehi Kupe was a chieftan and his tattoos represented his status. The text notes that Te Pehi Kupe created his self-portrait without the use of a mirror to accurately depict his tattoos. I plan to use these images when our class reads Chinua Achebe's Things Fall Apart, and we talk about the idea of multiple perspectives. There are so many different ways among the world's cultures to perceive ourselves and others; I think these works of art will create an interesting starting point for discussion. I teach AP English Literature, Linguistics, Writing Lab, and English 12 at the Milwaukee School of Languages. I started this blog in 2012 as a place to document my trip to Oxford and the London Olympics as part of a fellowship I won through the national Fund for Teachers organization.